You're the breeze, you're the cloud, you're the sunshine touching the ground. You're the gleam in their eyes, when they cherish how the grass is green, and how the plants grow. You're the one making sure the water - and life - gets where it needs to go. If only you could stop the others from doing the same... As the rain clears, the humans sniff the air and gently smile. Knowing you've been there doing the good work. They call you... Petrichor. 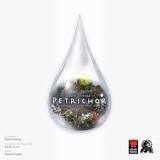 Petrichor is a highly interactive board game, playable by 1-4 people (up to 5 with the expansion). It's an action selection/area influence game, with 4 simple actions which interact with the various fields in ever surprising ways. The players move clouds with water droplets, and then rain those droplets onto specific fields, to make sure they have the right amount of water for the Harvest. During a Harvest, crops that have been watered enough are scored! Players are able to influence when, and how often the harvest happens. Players need to strike a fine balance between maintaining control of the different fields as well as influencing Harvest, to make sure the two come together in the optimal time. How to Play from Gaming Rules! Add a Review for "Petrichor"